Secret compartments can come in handy when you have to hide important or valuable items. There is always a need for security no matter what. You can build some secret compartments to store away those items with relative ease. 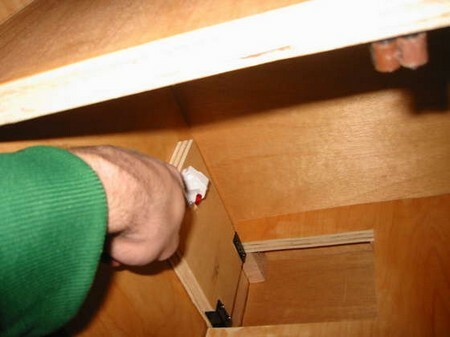 Here is how you can build secret compartments in your house. Continue reading to learn more. Go to your bathroom and locate your medicine cabinet. Outline the shape of it with a pencil. Locate any mounting screws. If the mount is keyhole shaped, simply lift the cabinet off the mounting. If it has regular screws, remove the screws with your drill. Place the cabinet flat on the floor. Make note of where the screws should go. This is also where the vertical studs are behind the drywall. Tap the wall to find the hollow place located between the screws. Mark this place with the pencil. You can count on there being a16 inch spacing between them. Draw a square within the pencil outline made in step 1. Use the level to line it up with the marks in step 2. Make sure the lines are level and straight before you draw them. Cut out the square outline carefully with the Drywall saw. Remove the wall you just cut out. Measure how far the studs are apart. Place a mark on the front and rear of the 2×4. Draw a perfectly straight line with the level between the marks. Cut down the lines as a guide with the saw. The 2×4 will be long enough to just fit between those two studs. You want a tight fit. Trim the length of the board as needed to achieve the desired fit. Put the 2×4 shelf you just constructed at the bottom of the square hole in the wall. Push the shelf into the correct position. It should be in the middle of the studs. Adjust the shelf by using the torpedo level. Make sure the bubble inside the level is directly in the middle. Now it is leveled. Use the cordless drill for this step. Screw your 2 x 4 shelf to the studs. Use two screws on the right side. Use two more on the left side. Drive the screws at a 45 degree angle through the shelving and into the studs. Now you can put all of your valuables in your new secret compartment. Replace your medicine cabinet back onto the same the way you took it down.